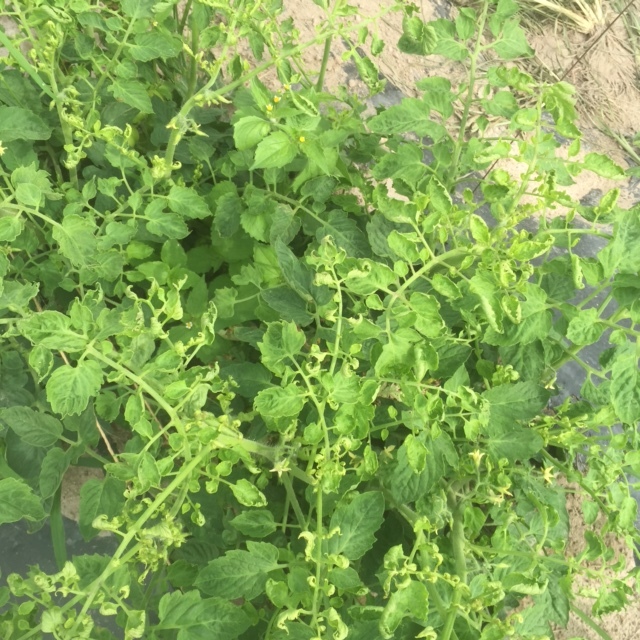 Roma tomatoes with damage from Triclopyr herbicide July 2016. 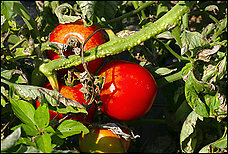 This time last year, we were suffering from a herbicide problem which stunted our Roma paste tomatoes. No, we didn’t spray herbicide on them. Someone else sprayed Triclopyr growth regulator herbicide (Ortho Poison Ivy Killer) on poison ivy down the road, behind some trees. He sprayed on 5/23, and made repeat sprays twice, about two weeks apart (approx. June 4th and 18th). As the crow flies, it might be 600 ft or so from the tomatoes. Some other brand names of Triclopyr include Grandstand, Alligare, Garlon and Horsepower. Other growth regulator herbicides include 2,4-D, Aminopyralid, Dicamba, Diflufenzopyr, Picloram, Quinclorac, as well as Triclopyr. On June 18 2016, we noticed some of the younger leaves on our plants were curling inwards and buckling an odd way. There were no obvious spots or mottling, but the sick plants were stunted. Most of the damaged plants were in groups in low areas. I thought it was a virus. We decided not to handle the plants until we had a diagnosis, for fear of spreading disease. We got help from the wonderful Virginia Tech Plant Diseases Clinic, who said the plants did not have any of the viruses they could test for, or that they knew, and the damage closely resembled growth regulator herbicide damage. But we don’t use herbicides, we protested. 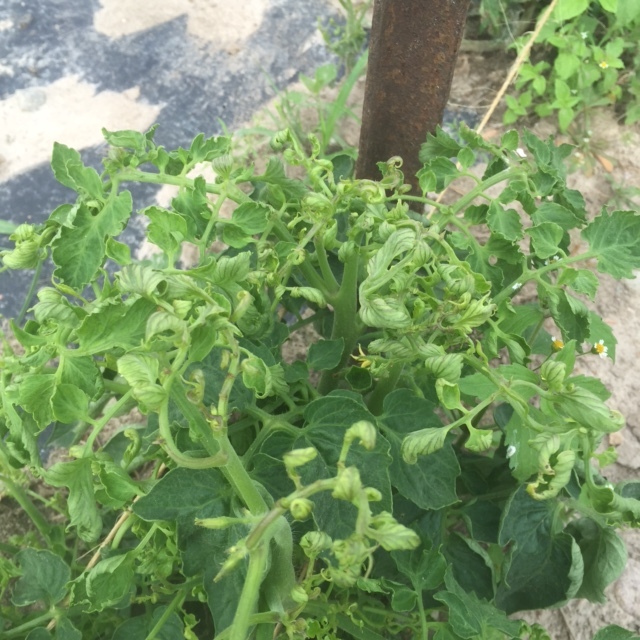 On 6/30 we found out about the initial Triclopyr spraying, but the Plant Disease Clinic at that point agreed that drift was unlikely, given the distance and trees in between our tomatoes and the poison ivy, and the pattern of damage. Triclopyr damage usually appears within one week, not 25 days later (we didn’t find out about the second and third spraying until later). On the other hand, we did not know of any other use of growth regulator herbicide nearby. Their final report, at the end of July, named herbicide drift as the probable cause. Roma paste tomatoes with oddly curled leaves due to growth regulator herbicide vapor drift. I researched some more and found information about volatilization on a herbicide website. High temperatures and low humidity favor herbicide volatilization, which can lead to vapor drift. Symptoms were consistent with chemical injury from a growth regulator type herbicide . . . Herbicide residue in straw mulch from herbicide-treated pasture or manure from animals fed on herbicide-treated pasture can cause similar symptoms. 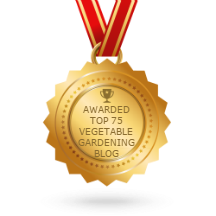 Since your tomatoes are growing out of the problem it is very unlikely that the problem was caused by herbicide residue in compost/manure/straw used to amend the soil. To definitively rule out herbicide residue in compost or the soil, I did a bioassay using snap bean seeds planted in numbered pots with tomato plot soil, compost like we’d used, and other garden soil. Beans emerge and grow quickly and can show up herbicide damage. Most of my bean seed in the bio-assay got dug up and eaten by something. . . such is agriculture! Only one bean came up (out of 48). The bean plant looked fine. It was in a pot of soil from one of the worst tomato plants. This indicated that it was not a problem in the soil (eg from compost or other soil amendments). Drift still seems rather unlikely to me – the pattern of damage, the tiny ready-to-spray bottle so far away. . . It’s sobering how damaging those herbicides can be! Since then I have acknowledged it most likely was vapor drift. I’ve now found a Herbicide Injury Image Database from the University of Arkansas Extension Service. It covers 18 herbicide groups and you can search not just by herbicide group, but by brand name of herbicide, by crop and even a paired search of crop and herbicide. Sadly it doesn’t include the very pairing (tomatoes and Triclopyr) that we were most interested in, but it does have many, many good photos of other combinations. Recently a friend was showing me her damaged greenhouse tomatoes, which were growing out (recovering) after suffering some damage which caused the stems to make stubby shortened branches. She thought she’d caused the problem by using horse manure after stacking it for “only” 6 months. She thought she was looking at a type of “burning” from manure that was too fresh. I thought it might be damage from one of the “killer compost” herbicides which survive in hay or straw from sprayed fields, survive through composting, survive through livestock digestive systems, and wreak havoc on vegetables. 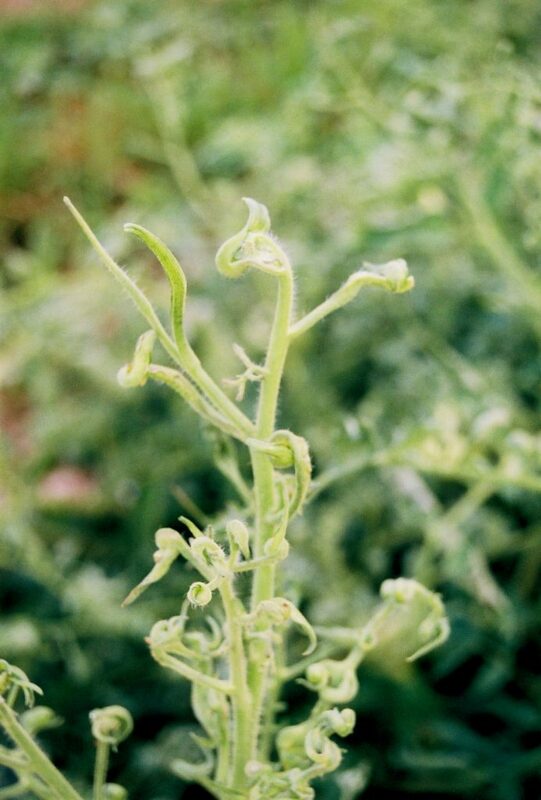 I looked through the Tomato section of the Herbicide Injury Image Database but I didn’t see exactly what my friend’s plants had. It most resembled the Quinclorac (Facet, Quinstar) damage but I really don’t know. Tomato damaged by Quinclorac herbicide. Waterpenny Farm, Sperryville, Virginia suffered herbicide in hay mulch in 2007. The hay they bought had been sprayed with Grazon. They lost 12,000 plants with a harvest worth $80,000. Grazon is another of the growth regulator herbicides like the Triclopyr we were blighted by. Chert Hollow Farm suffered fungicide spray and wrote about pesticide drift part 1 in three episodes, part 2 and part 3. Don’t let this happen to you (if you have any control over it) and if it does, seek help. On a happier note, the August Growing for Market magazine is out. 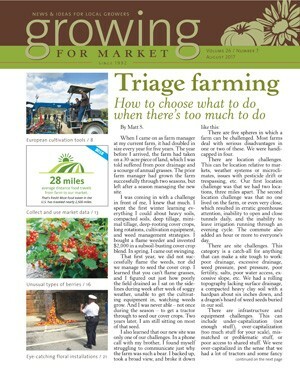 There is a long article about Triage Farming: How to choose what to do when there’s too much to do by Matt S. An important topic and just the time of year when this massive problem hits us. Matt has a sense of humor, which really helps in hard times. 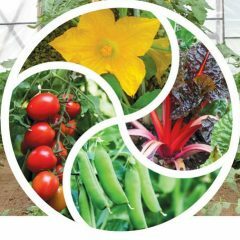 There’s also an article European cultivation tools by Sam Hitchcock Tilton. This is followed by Farmers market metrics: Collecting data has many benefits for vendors by Darlene Wolnik. Then a very appetizing article about berries by Michael Brown and a dramatic article on big floral installations for weddings and other events, by Gretel Adams, which includes some very eye-catching and original ideas.